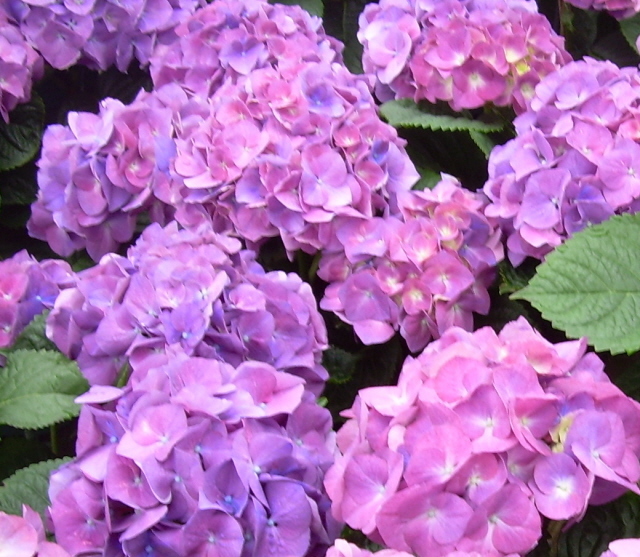 The following is a list of sizes of dormant hydrangeas offered at the corresponding ship month and finishing times. For shipping march and beyond we supply plants as they are available. Unsold inventory and special requests. MERRITT SUPREME has replaced Rose Supreme as the most popular variety. Due largely to the fact it is early, flowering 1 week earlier than most and 2 weeks earlier than Rose Supreme. Flowers are smaller than Rose Supreme (but large). Less bench space is needed compared to Rose Supreme and the plant is shorter and does not require as much B-Nine. Merritt Supreme grown as pink tends to be a dark rose color. The variety has well rounded grower between stem size and overall height, usually not requiring more than one application of B-Nine at 2500 ppm during forcing. It is grown extensively in all areas and seems to stand up well in the heat but, perhaps not as well as Rose Supreme. MERRITT SUPREME BLUE can also be forced as a blue. It is a popular option for blue/purple color because it is often forced with Merritt grown as pink. The benefit of the same variety forced at the same time producing two distinctly different colors often times out weight the fact that it is not a "true" blue color. Merritt Supreme blued often produces a deep purple shade. It can range from a light purple to a deep blue in color. The picture at left is a middle of the road Merritt Blue. KUHNERT is difficult to grow in the summer but is an excellent forcer if grown cool. It blues easily giving clear light blues. Kuhnert is not particularly adapted for southern forcing although some use it for its color. Flower heads are softer when grown in warmer conditions. At D&W all Kuhnert is blued in the summer. It branches well and will have smaller flowers. It typifies the "European" varieties but has been grown in the U.S. for years. Usually requires around 2 B-Nine applications when forcing. MATHILDA GUTCHES is a European variety which branches profusely. Flowers are smaller than some but the show is comparable because of flower numbers. It makes an excellent medium blue as well as medium pink. At D&W however we pre-treat all Mathilda Gutches for Blue during summer forcing. It is a well formed plant with excellent steel-blue flowers. It is likely the most popular variety at present for blue. It can be tall and does require B-Nine because of its smaller diameter stems. It flowers one week later than Merritt Supreme. In most situations Mathilda Gutches requires staking. SISTER THERESE is white. Most whites are not of the quality as regards hardness of flower and compactness of growth as Sister Therese. Sister Therese is as good as any and better than some. It forces early and readily with large size heads. It requires extra protection against sunburn as do most white hydrangea varieties. It will not usually need B-NINE early but will benefit from a "toning" application later after height is nearly established. FIRELIGHT (Leuchtfeuer) has been widely available on the American Market for over 20 years now. It is dark pink and more rose colored than Merritt Supreme. Under very cool finishes (50-55 degrees F) it can be nearly red. When blued Firelight makes a deep purple color, some describe it as the color merlot. This variety will not turn a clear blue but the purple is quite distinct. It breaks freely, has sturdy stems, and large, beautiful heads. Some say it is susceptible to Mildew but that has not been our experience. We believe it to force slightly slower than Merritt. It apparently performs well in the south. It is a vigorous variety that generally needs B-NINE. Flower heads are usually slightly larger than Merritt Supreme. It is quickly becoming one of the most popular varieties on the market with increasing demand each year. Highly recommend. BLAUMEISE PINK at present is the Aking@ of the Lace Caps. Both as a delightful medium pink and distinct blue. Stems are very strong and rarely need staking. The plant is vigorous and needs growth regulation. Flowering is about 7 days earlier than Merritt Supreme. It is easy to grow since it is so strong and vigorous. Root system is always very good. BLAUMEISE BLUE Perhaps no Hydrangea is quite as bright blue as Blaumeise. It is easy to grow since it is so strong and vigorous. Root system is always very good. Pictured here as a Blue. it has intense deep blue sepals when blued correctly. REGULA was at one time discontinued here at D&W. But in recent years it has been making a comeback. It is a very large hydrangea. Very large flower heads. Large thick stems. Big medium to dark green leaves. Forces slower then most. about 1-2 weeks later then merritt and about a week slower then mathilda. Flowers start out green and change to a white cream color. Very heat resistant as compared to other white varieties. Popular for larger pot forcing. BLUE DANUBE is offered on a limited basis. 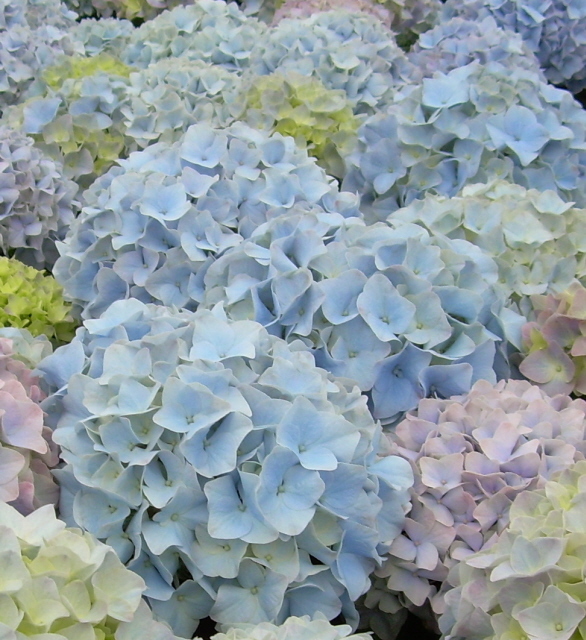 We prefer Mathilda Gutches over blue Danube when forcing a blue hydrangea. This is due to Mathilda's larger growth habit. It can be difficult to develop adequate plant size with Blue Danube. Canes are more sturdy then Mathilda and often time do not require staking. The flower color when blued is a deep attractive blue. Growth is more compact than most. Similar in size to Schone.When forcing little to no B-Nine is required. LYBELLA is a white lace cap variety with good foliage. We prefer Lybella in our own production compared to Sister Therese. Lybella sepals are more rounded and cupped. The sterile flowers tend to obscure the fertile flowers of this lace cap variety. Flower heads tend to fill half in with sterile white flowers. SCHONE BAUZERIN is a newer variety to the American Market. A Merrit Supreme Look A Like. Flower heads are similar in size and color to Merritt Supreme. Overall plant height is a little shorter than Merritt Supreme. Canes are strong and compact with only minimal staking required. Foliage is Deep green and the overall quality of this variety is good. SNOWBALL is a spectacular clear white. Snowball is a newer variety to us here at D&W. From what we have experiences it is a good grower with medium cane strength. Flower heads are medium to large with pure white color. Many white varieties always have a tint of green or yellow in the flower color, snowball is clear white. 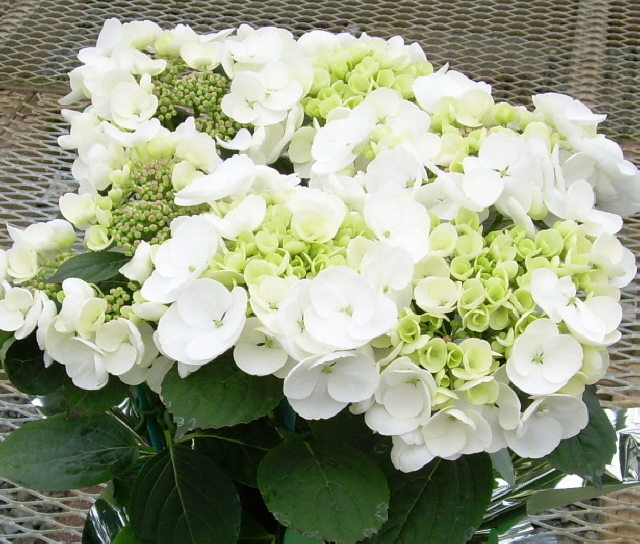 Has proven to be a great addition to our hydrangea line with increasing popularity at Christmas. Plant is more compact and shorter then some and forces 1-2 weeks faster then merritt. BERLIN� newer German variety somewhat widely known. Very strong stem vigorous grower. Color is light pink to light blue. Flower heads are large and sturdy. Crisp dark green foliage. Some growers have experiences some lower leaf yellowing but we here have not. Variety should get some consideration from most growers as the plant has many very good characteristics. Timing is one week later than Merritt Supreme. ROSABELLA has a pink and white "picotee" flower head. Sepals are white boarded with pink centers. The variety flowers about the same as Merritt Supreme but is somewhat shorter. We here at D&W feel that it should have at least 1 application of Pro-Gib� (see cultural instructions). 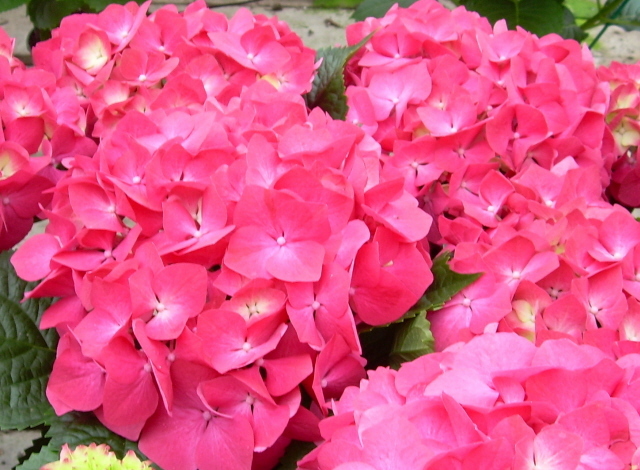 This variety is very much a novelty while some basic characteristics like foliage and plant height are lacking, the flower color often makes up for all other areas. ISABELLA has a pink and white "picotee" flower head. Sepals are white mixed with pink. The variety flowers about the same as Merritt Supreme and is similar in height. This variety is very much a novelty while some basic characteristics like foliage and plant height are lacking, the flower color often makes up for all other areas. HORBEN is an older Blue variety. It makes a distinctly clear blue. Very similar in color to Mathilda Gutches. Canes are thick and do not often require staking. But plant is much more compact then mathilda and can be a problem to get to adequate size. For this reason it is only suitable for late forcing.